Your indispensable guide to evidence-based practice (EBP). Evidence-based practice is becoming a real force in a rapidly growing number of organisations and public services. Even traditional organisations like the police have a growing body of evidence-based practitioners and functions to support the promotion and embedding of evidence-based practice as well as the development of skills and expertise and allocating resources to EBP. This guide will take you through all the essentials of evidence-based practice and point you in the direction of additional resources, sources and show you the relevant research evidence. NB. Please note this is a living, continually updated document. As a result it changes and is added to frequently as new research and practice-based evidence become available. If there is anything missing or needs correcting please do let us know. The stages of evidence-based practice – what’s involved? How evidence-based practice is promoted and people are introduced to it. Essentially evidence-based practice is about improving our decision-making by using clear, well-researched andevidencedjustifications for why we do things in certain ways, with the ultimate goal of delivering continual improvements, learning and excellence in our organisation or business. In short, it is about developing and fostering best practice and thinking by looking at and critically considering the real evidence about the issue. Probably the most avid users of EBP are the health care and aviation industries. Evidence-based practice has revolutionised the way health care is undertaken in many countries around the world and has improved health care outcomes and impact for patients as a direct result. In the aviation industry evidence-based practice has dramatically increased safety, reduced costs and increased operational effectiveness across the board in what is one of the most heavily regulated industries on the planet. We will be looking at examples from both of these industries use of evidence-based practice throughout this guide. Increasingly, clinicians, engineers and pilots in health care and aviation are basing most of their operational work on EBP these days, placing an ever increasing emphasis on using and creating good evidence as a basis for their work and decisions. As a result clinical expertise has increased alongside better patient outcomes and in the aviation industries better safety, working practices, use of materials and construction methods have delivered greater efficiencies, profitability and productivity as well as better customer outcomes. Derivatives of this definition have extensively been used and acknowledged in many contexts from medicine, policing, the military, construction, engineering, to housing and social care. In essence organisational evidence-based practice (EBP) refers to the systematic process where-by decisions are made and actions or activities are undertaken using the best evidence available. The aim of evidence-based practice is to remove as far as possible, subjective opinion, unfounded beliefs, or bias from decisions and actions in organisations in order to achieve to goals of the organisation. Explicit knowledge refers to the codified, formal information that can be easily shared such as this guide, instructions, book contents etc Tacit knowledge on the other hand refers to the type of information that is difficult to transfer to others such as our subjective and personal intuitive understanding about how we sense or feel things, or how we know how to do something. They are often referred to know-what (explicit knowledge) and know-how (tacit knowledge). In 2006 an American Presidential Taskforce on Evidence-Based Practice 2 made an interesting distinction between EBP and what are known as ’empirically supported treatments’ or ESTs. A treatment in this context refers to any solution being proposed to deal with a problem. In essence, an empirically supported treatment is an evaluation of the evidence of what effect or impact a particular solution to an issue is likely to have in a given situation. Whilst empirically supported treatments may form part of the broader application of evidence-based practice, it is not on it’s own sufficient to be considered to be EBP. Empirically supported treatments start with the the treatment and asks whether it will work in the situation at hand. Evidence-based practice on the other hand starts with the customer, client or patient and asks what research evidence will assist in achieving the best outcome for them. The goal with EBP isn’t just to solve a particular problem but to find out what we can learn to obtain the best outcome for the enduser. In terms of a definition of evidence-based practice this helps to clarify the broader scope of the general and habitual practice of using best evidence to find the best outcome rather than simply evaluating the potential effectiveness of a particular solution. There is a complete regularly updated guide to decision-making at the bottom of this page. These approaches however can frequently lead to misguided and biased decisions, yet they are frequently still regarded as the best method by many individuals and organisations. The devastating impact of opinion-based decisions – See this article about the devastating effects of opinion based decision-making. The application of evidence-based practice does not mean that experience and judgment are no longer applicable. On the contrary, they remain vital, but only where they are used in conjunction with evidence to consider the facts about what approach to take or decision to make, to reduce the likelihood of bias, habit or cultural preference swaying the results. The aim with the application of EBP and personal judgement is to apply them in a critical manner, avoiding or at least being aware of the assumptions being made. Evidence-based practice is meant to focus on the practical to help people understand what evidence there is, or is not, for their work practices, polices, procedures and decisions. Just because something appears to work doesn’t mean it does to the extent people believe it does and there may be unseen side effects or consequences that a more fully explored and evidenced approach may well discover. In medicine, EBP is referred to as a process that allows physicians and clinicians to assess research and guidelines on clinical procedures from highly trusted findings and then apply them in their daily practice. So placed into the context of organisational evidence-based practice this means that EBP is a set of processes that allows practitioners (employees), managers and leaders to assess research, guidelines, policies, procedures, working practices and decisions from trusted research findings and apply them in their daily practice, with an emphasis ondaily practice. This focus on the practical is really important. It is vital that individuals and groups in the organisation are motivated to implement changes and that they regard the introduction of EBP as useful, valuable and important. If many individuals feel that the existing way of doing things is still the best approach, then there may be resistance to adopt and use EBP. In short, a change of culture may have to take place in the organisation to facilitate EBP in practice, but more of this in the implementation section of this guide. Within all the available sources of evidence, hierarchies exists – some types of evidence are seen as more valid or carry more weight than others (see the section below: Hierarchy of Evidence)6. The basic 5 stages or steps of evidence-based practice – what’s involved? First of all, EBP requires an assessment of the given situation and formulation of the basic question or questions (hypotheses) that need to be answered in order to address the problem. Secondly, the evidence should be acquired through a systematic search of online resources, books and, in many cases, specialist journals/databases in the field. There is a convention as to what is considered to be the best evidence – see the next section of this guide. An assessment and appraisal of the materials/evidence needs to take place to consider the applicability and validity of the given evidence about what type of action or intervention to pursue and to inform a final decision. The next stage involves integrating the new knowledge into the organisation and applying it in practice. Finally, an evaluation of performance takes place through mechanisms, such as feedback from relevant stakeholders. Generalisability – how applicable are the findings to a wide range of scenarios or do these finding only really relate to a very specific set of circumstances or conditions? Reliability – how stable and consistent the results of a study are over time? If we do the study again are we going to get the same results? Replicability – can the study be repeated and retested? If not how can we make any claims of reliability? Subject variability – you have a particularly un-representative subject pool. They are all university students and don’t represent the general population for example. Size of the subject population. Having a study based on looking at 5 people is quite different and will effect the validity of a study differently from a study of thousands of people. Time – was the study conducted once in a short space of time or over a longer period of time. External validity – This refers to whether the study in question is applicable to the situation you want to apply it to. A results of a study conducted on pre-school children might not have much external validity when applied to a group of combat soldiers for example. Authority – has the study come from a well known and respected academic/university or a consultancy selling a product or service for example? Peer-reviewed – has the study or paper been through a process of checking and critique by fellow researchers or is it self published? Primary sources – this refers to data that has come direct from the source in question. For example eye witness accounts, legal or historical documents, raw data, the direct results of experiments or research. Secondary sources which include second party analysis, summaries, evaluations, opinions, comments, articles etc that do not have first hand experience or knowledge of the issue or event. As we go up the pyramid there is more likelihood of greater levels of reliability, validity, generalisability and confidence and as we go down there is an increased risk of bias, and potentially lower levels of reliability, validity, generalisability and confidence. This however does not mean that case studies have no usefulness. It just means that they are situated in a particular context that may or may not apply to your situation. The evidence-based practitioner needs to be able to understand and evaluate the nature of the evidence they are dealing in, and with reference to the context within which they are going to use the evidence, before using it. The Ancient Greeks – Pedanius Dioscorides and Galen of PergamonWhilst the history of Evidence Based Practice can actually be traced back the ancient Greeks, in particular Pedanius Dioscorides (AD 40-90) was a Greek physician, pharmacologist, botanist, and author of De Materia Medica a 5-volume Greek encyclopedia about herbal medicine and related medicinal substances (known as a pharmacopeia), that was widely read for more than 1,500 years. He was later employed as a medic in the Roman army. Later Galen of Pergamon (AD 129-216) who also served the Romans the most accomplished of all medical researchers of antiquity, Galen influenced the development of various scientific disciplines, including anatomy, physiology, pathology, pharmacology, and neurology, as well as philosophy and logic. Archie Cochrane and modern day evidence-based practice. However modern day connections of evidence-based practice really stem from the work of Archie Cochrane a Scottish doctor noted for his book Effectiveness and Efficiency: Random Reflections on Health Services.6 This book argued for a more systematic and rigorous approach to medicine and championed the use of randomised control trials to make medicine more effective, efficient and reliable. This campaign for the use of randomised controlled trials eventually led to the development of the Cochrane Library database of systematic reviews (more about these below), the establishment of the UK Cochrane Centre in Oxford (http://uk.cochrane.org) and the international Cochrane Collaboration, a collection of 14 evidence-based medicinal research centres. The tag line of the Cochrane centres is “Trusted evidence. Informed decisions. Better health.” 7 which sums its mission up nicely. Cochrane is known as one of the fathers of modern clinical Evidence-Based Medicine and is considered to be the originator of the idea of Evidence-Based Medicine. He was known for arguing that medical strategies should be thoroughly and rigorously tested before being used on human beings. This advocacy for the use of evidence before practice laid the foundation of evidence-based medicine. He is particularly known for emphasising the need for random studies to be carried in different places to guarantee the accuracy of the evidence and the reduction of bias the tendency of medical practitioners to push their favourite home grown theories about best practice. This shift from the personal experience-based intuitive and deductive reasoning of individual medics into a systematic, scientific and rigorous process was really the foundation of all modern evidence-based practice. This approach to the practice of medicine rapidly gained ground as the results and outcomes on health care became measurable apparent. In the early stages of evidence-based medicine, some practitioners railed against it, stating that it was too slow and negated the vast experience of many professional medics. As well as the environment or background existing at the moment. This last element is important, as practicing medicine in a well-staffed well resourced hospital in the west is often entirely different to doing so in the middle of a battlefield in a developing country where resources are few and far between. This idea of evidence-based medicine really came out of the work and efforts of Dr. David Sackett who argued in 1996 that evidence-based practice is not solely based on research 8 but that also embraces medical expertise too. He further explained that patients’ needs and preferences could be taken into account by the evidence-based practice and this is what revolutionized evidence-based practice. The Transdisciplinary Model model displays the components of EBP and how they can be applied to larger organizational levels such as in medical facilities and any organisation. The intention here is to show that evidence-based decision-making spans a range of sources and is not purely based on academic research and incorporates more operational and experiential elements of expertise. Time constraints are regularly cited in every profession as being a key barrier to the application of EBP. For instance, in education, research indicates that teachers and instructors suggest that they are generally pushed to the limit and that the time needed to do research and introduce best practice is difficult to find. This is often because, in an ever-demanding workplace, specialists in most fields find that they often have to “wear multiple hats”, leading to legitimate concerns about time availability. 12 A number of studies have found that time constraints to source, obtain and translate research studies into something that is practical is the number one barrier to implementing and maintaining evidence-based practice across all professions. Another key issue is a lack of support at organisational and managerial levels to give people the time to engage with the research needed to implement EBP properly. This can be overcome through the introduction of reliable administrative support in the organisation and a careful consideration of priorities when the application of EBP is likely to bring substantial transformative benefits or by using specialist research translators and providers like The Oxford Review. One of the biggest issues and barriers is how evidence-based practice is promoted and people are introduced to it. A systematic review of post-graduate development of medical evidence-based practitioners11 found that whilst standalone classroom-based teaching improved knowledge it does not develop but not skills, attitudes, or behaviour. However the research shows that clinically integrated teaching (actually using and being mentored / coached in the context the practice is going to be used) improved knowledge, skills, attitudes, and behaviour. to increase the likelihood of a favorable outcome.” 3. Evidence-based practice it is not solely focused on being dependent on peer-reviewed research. Experience plays a vital role in evidence-based practice, only it’s not any old experience that counts here. There is experience and experience. Understanding the role of experience in evidence based practice, and what types of experience that is matters. Not only is there is there a lot of research evidence about evidence-practice but over the last 10-20 years or so there has been a significant expansion into specific applications of evidence-based practice. As mentioned above the oldest and most established area of EBP is medicine followed by aviation. The police in many countries are now developing a serious interest in the topic as well for many of their roles and functions. In the broader organisational and human development space there are also significant developments on this front. APA Presidential Task Force on Evidence-Based Practice. “Evidence-based practice in psychology.” The American Psychologist 61.4 (2006): 271. Gill Harvey, Alison Kitson,Implementing Evidence-Based Practice in Healthcare: A Facilitation Guide(London: Routledge, 2014), pp. 47-65. Murphy, M., MacCarthy, M. J., McAllister, L., & Gilbert, R. (2014). Application of the principles of evidence-based practice in decision making among senior management in Nova Scotia’s addiction services agencies.Substance abuse treatment, prevention, and policy,9(1), 47. Straus, S. E., Glasziou, P., Richardson, W. S., & Haynes, R. B. (2018). Evidence-Based Medicine E-Book: How to Practice and Teach EBM. Elsevier Health Sciences. Satterfield, J. M., Spring, B., Brownson, R. C., Mullen, E. J., Newhouse, R. P., Walker, B. B., & Whitlock, E. P. (2009). 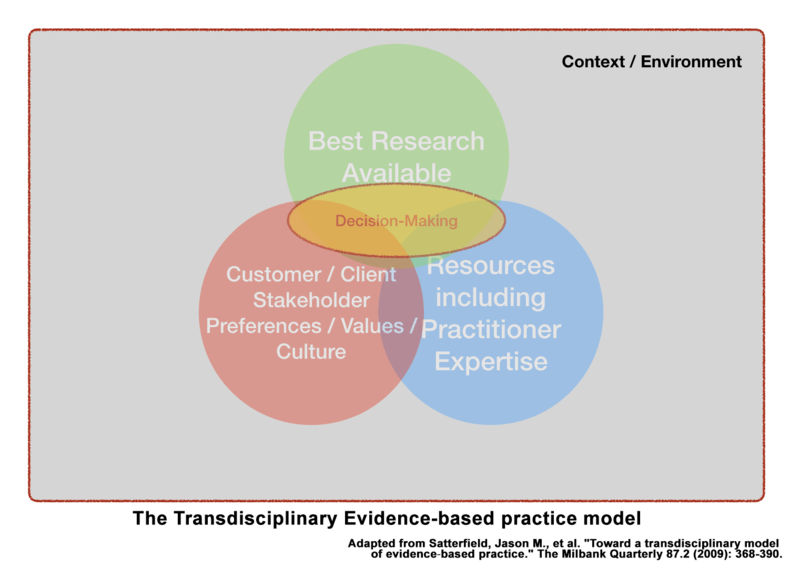 Toward a transdisciplinary model of evidence‐based practice.The Milbank Quarterly,87(2), 368-390. AnBussières, A. E., Al Zoubi, F., Stuber, K., French, S. D., Boruff, J., Corrigan, J., & Thomas, A. (2016). Evidence-based practice, research utilization, and knowledge translation in chiropractic: a scoping review.BMC complementary and alternative medicine,16(1), 216. W. McCarty, C., Hankemeier, D. A., Walter, J. M., Newton, E. J., & Van Lunen, B. L. (2013). Use of evidence-based practice among athletic training educators, clinicians, and students, part 2: attitudes, beliefs, accessibility, and barriers.Journal of athletic training,48(3), 405-415. Manspeaker, S., & Van Lunen, B. (2011). Overcoming barriers to implementation of evidence-based practice concepts in athletic training education: perceptions of select educators. Coomarasamy, Arri, and Khalid S. Khan. “What is the evidence that postgraduate teaching in evidence based medicine changes anything? A systematic review.” Bmj329.7473 (2004): 1017. Hübner, Lena. “Reflections on knowledge management and evidence-based practice in the personal social services of Finland and Sweden.” Nordic Social Work Research 6.2 (2016): 114-125.